A simplified memory map of the Micro-KIM is shown below. This tutorial explores the 2K EPROM, leaving a more detailed exploration of the free RAM and 6532 RIOT for later. Address space $1400to$173f is unused in the standard Micro-KIM kit configuration. Perhaps reminiscing the past is a sign of getting older, but I cannot help but look back fondly at the times I learned programming machine code on the Commodore 64 in the eighties. Therefore, it is probably no surprise I still occasionally enjoy programming 6502 on the Micro-KIM, which is a modern replica of the seventies KIM1 microcomputer, made available by the well-known retro computer kits provider Briel Computers. 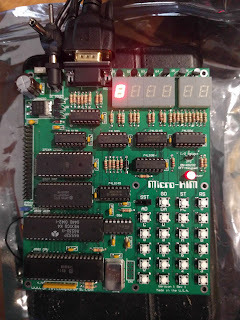 A rainy weekend was a perfect excuse to play with my micro-KIM, which had been collecting dust in a drawer for too long. I had fun using my own cross-assembler to develop and generate programs in paper tape format, and upload these to the micro-KIM via the PuTTY client. I figured out how to use the 6532 RIOT to set up a timer-based interrupt service, which is an important step in separating actual computation from display and keypad handling. The following clip shows the difference between incrementing a three-byte memory counter at roughly 1000 times per second (timer delayed) and 100,000 times per second (full speed with about 10 cycles per iteration at 1MHz). Perhaps a nice illustration of how fast even those early computers were.